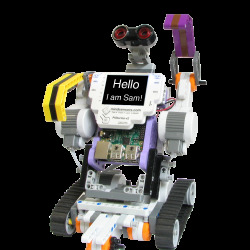 To update the firmware on mindsensors.com sensors from an EV3 use following instructions. Use Win32 Disk Imager or Etcher to write this image to the microSD card. If you don't have firmware ZIP file, please send email to mindsensors.com support. Make sure the deviceName above matches the device you are planning to upgrade. Insert the microSD card in your Windows Computer. 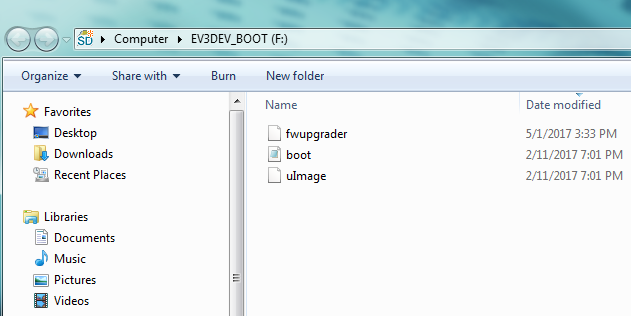 You should see a drive named EV3DEV_BOOT (E:) as pictured here. There should be two files here, boot.scr and uImage. Ignore those, copy the fwupgrader file from the .zip you downloaded next to these files. Power OFF your EV3 brick. Connect the device you need to upgrade to sensor port 1 of the EV3. Press the center button to power on the EV3. You should see ev3dev in ascii art at the top, console messages scrolling by, and the LEDs flashing orange. Allow a minute to pass for the system to fully boot up (watch the sceen for instructions). When prompted, disconnect the device and watch the screen. It will prompt you to reconnect the device (reconnect immediately when it prompts). When you reconnect it, do not disconnect the device until the firmware upgrade process is complete. You will be prompted to remove the device when finished to complete the upgrade. Your device is ready for your use. The ev3 brick will power off automatically after few seconds.